Spectra: Low-resolution spectra obtained by U. Munari (INAF Astronomical Observatory of Padova) and A. Milani, P. Valisa, F. Castellani, and R. Belligoli (ANS Collaboration) on 2014 Mar. 9.792 indicate Nova Cep 2014 is a highly reddened Fe II-type classical nova near maximum. Spectroscopy details may be found in CBET 3825 (see Note a below). Observing recommendations: Observations of all types (visual, CCD, DSLR, spectroscopy) are strongly encouraged in following the evolution of this nova. Charts: Charts for Nova Cep 2014 may be created using the AAVSO Variable Star Plotter (VSP) at http://www.aavso.org/vsp. Submit observations: Please submit observations to the AAVSO International Database using the name NOVA CEP 2014. Once a GCVS name has been assigned, please use that name. a. Announced on IAU CBAT Central Bureau Electronic Telegram 3825 (Daniel W. E. Green, ed.). b. The object was designated TCP J20542386+6017077 when it was posted on the Central Bureau's TOCP webpage (http://www.cbat.eps.harvard.edu/unconf/tocp.html). c. Confirmed by Nishiyama and Kabashima on five 5-second unfiltered CCD frames taken Mar. 8.7987 UT. - Nishiyama and Kabashima, 2014 Mar. 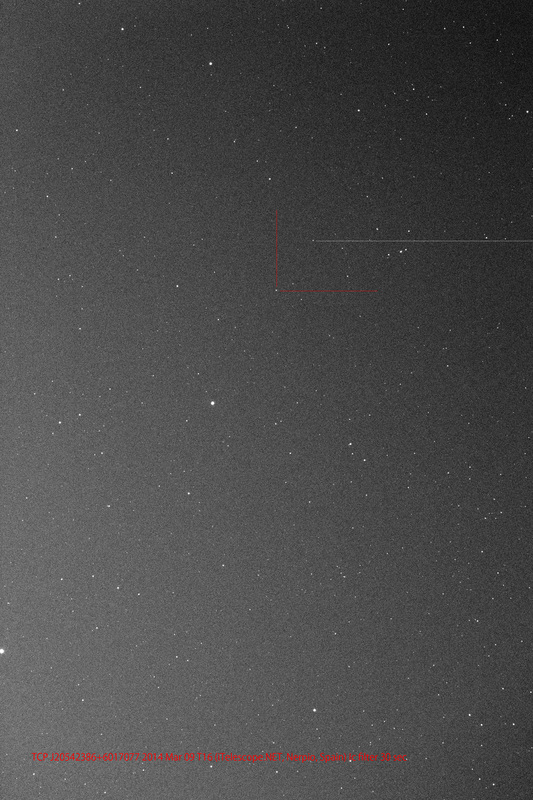 8.792 UT, 23.86s, 07.7"
- A. Oksanen (Hankasalmi Obs., Finland), 2014 Mar. 8.922, 22.60s, 08.9"